One of my pins ready for resale. 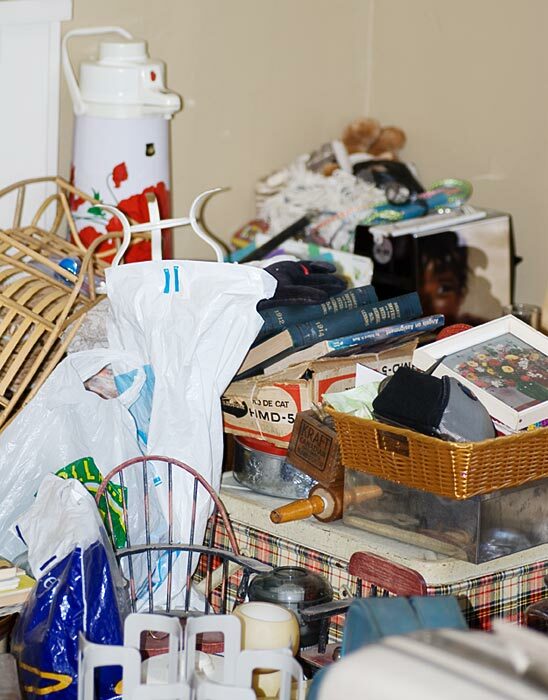 Have you ever found yourself in need of a rolling pin, and then not been able to find one? Just such an event took over my life a few weeks ago. Such a silly thing, yet something one needs to perform certain cooking acts, like rolling out pie dough, or cut-out sugar cookies. And at that point, a rolling pin wasn't something I had. Actually, it wasn't something I expected to need either, until I did need it. Oh yes, I have several rolling pins ... at home in Canada. But not a single one in our Florida home. Back in Canada, I still have 3 or 4 rolling pins (out of the dozen I used to have, including a tupperware one) ... one is a solid rolling pin, and while it has handles, they are part of the body of the rolling pin. I don't like it to work with, but I kept it because it was handmade by a family member. 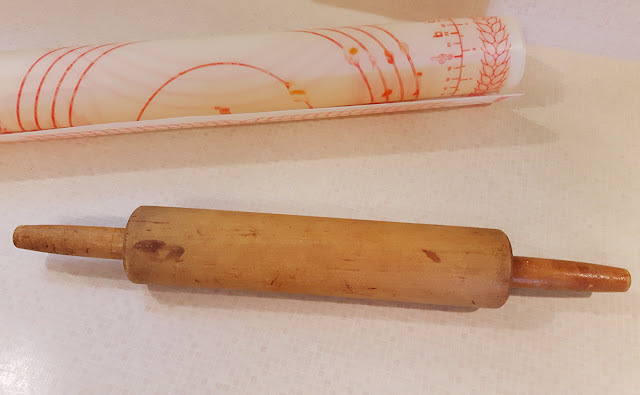 I have a wooden rolling pin with ball-bearings between the handles and body, and it rolls beautifully; no hitches and nothing causes it to catch while rolling. It was my most-used pin until I got a marble one. The marble rolling pin is heavy - very heavy. For a while after receiving it, I refused to use it because it was so heavy but in later years, it's become the rolling pin I use all the time. The one remaining pin that I have (and use sporadically) is a shortbread pin. It's a smaller, lighter pin with pattern indents carved in the wood. The body part fits perfectly between the edges of my cookie bake pan with no gap. I use it when I want to mark shortbread ... and that's very rare these days, but it's a hard pin to come by, so I keep it. Bearing Handled Pin from Bed, Bath, Beyond. Back home, one can acquire a rolling pin for about $2 or less at any garage sale or second hand store. The same cannot be said for Florida ... apparently not, anyways. When I realized I need one to bake a pie at Christmas (that's another story ... our first Christmas in Florida, and we hated it), I went looking for one. Several stores we tried didn't have any such thing as a rolling pin. In one store, a woman told us she hadn't seen one for years! Only one of the stores we tried had one (Dollar General), and it was a smallish, light-weight, non-ball bearing model, and I tried 4 of them on the shelf to see how they'd roll ... and none of them went past the halfway roll without getting caught on it's own axle. They were $5.95, but not worth the $1 I'd have been willing to pay. I also found one wooden pin (well seasoned, which is a plus) at the Salvation Army second hand store in Lakeland, but I absolutely refuse to pay $6.00 for a wooden rolling pin that doesn't have the ball-bearing handles in it. That was far too much. In fact, that SA store is rather expensive. An old hair straightener was $16.95; and a beat-up blow dryer was $7.99. I find that really tough to swallow. 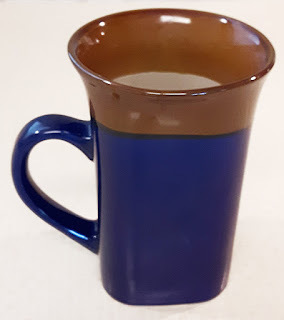 Back in Canada, our Salvation Army shop sells things like that for $1 or $2, and mugs sell for 25 cents a piece (the mugs in the Lakeland one were $2 up to $5). I can buy a nice mug at the Dollar Tree for $1, so why would I pay that much for some old used mug? The SA shop really needs to rethink their pricing. Out of desperation, I asked a few neighbours ... one did have one that she let me borrow. Apparently not something she used much as she had to go looking for it, and then told me to keep it until I found one. The rolling pin I borrowed from a neighbour. This past week we went to a flea market in Zephyr Hills (the Patriot Flea Market) and I knew there was a guy there that sold a lot of bakeware and kitchenwares, so I stopped there and found exactly what I wanted. A marble rolling pin. It was more money than I wanted to pay ($14.95, and yes, I'm cheap) but better priced than the ones I found online (some were over $30 + shipping cost). Now I have the rolling pin ... but have been too sick to bake. <sigh> That's pretty much how this winter in Florida has been going so far. It's been pretty cold for a Florida winter. Colder than we've experienced before. Some areas of northern Florida have had some snow as well ... it hasn't come this far, but this morning the temperature was below freezing here, and that's rare for this part of the state. I'm running out of warm clothes. I always bring a few things for cool weather but not enough for a solid month of it. I'm getting tired of wearing the same things! Anyway, at this point ... it's a thumbs-up for my new marble rolling pin.